The potting bench has a wooden construction making it more sturdy and durable. The potting bench has a fantastic design. Thanks to the three tiers, you can put and display your much potting easily. This potting bench also has three hooks on the side. It is really convenient for you to hang some small tools. They can help you save more space. 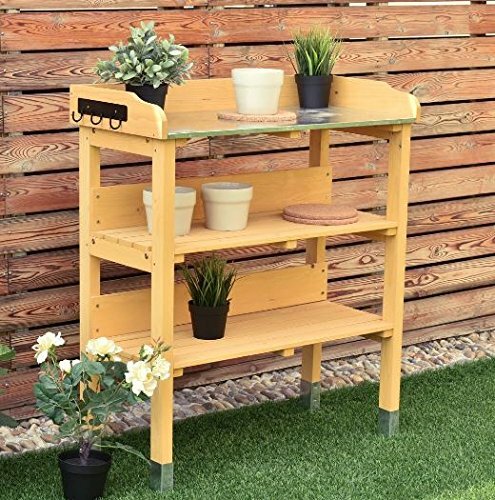 If you own this potting bench, it is sure to be a great display in your garden. Whenever you walk into the garden, the planting bench can bring you a wonderful sight experience. Distance from top shelf to ground: 31.9"
Distance from middle shelf to ground: 21.8"
Distance from bottom shelf to ground: 11.8"
If you have any questions about this product by K&A Company, contact us by completing and submitting the form below. If you are looking for a specif part number, please include it with your message.